fight for justice for women or fight to rule over women? In every culture and in every part of the world, this injustice is present. What is the oldest injustice in the world? It is the way that “we” view, treat, and oppress women. It would be erroneous for me to say that Asian culture is entirely proned to be against women but I can share my personal experience that as a young Korean man, I was influenced – partly through the Confucian culture and worldview that women were born to serve their fathers as young girls, their husbands when they got married, and their grown sons when they were older mothers. Their lives and purpose – in part – revolved around men. As a person of the Christian faith, I learned – in bits and pieces (both in subtle and occasionally in direct ways) that women should be our “partners.” They should be quiet, submissive and know their place. Obey and honor their fathers, love and submit to their husbands, and raise godly sons and daughters. Why didn’t I learn that women and men are both created in the beautiful image of God? Why didn’t I learn that while we have different roles, we are also created equal in the image of God? Why didn’t I learn that through Christ, women and men can do all things through Him who gives strength and grace. But at one point today, you said, “Women, you were created equal to men in the image of God.” I mainly write because I don’t know if you realize how powerful that statement was. I don’t know if you realized what it would feel like to hear that statement coming from a man — what it would mean to me, and possibly to other individual women and men. You didn’t even say it to me individually…I have never been told by a man, Christian or not, that I am equal to him. I have never been told by a man that I am equal to him. And equal in that we are both created in the image of God…I cried all the way home. How is it that I’ve never been told by a male person that I am equal to him? That I am equally beautiful and broken? That we are both created in the image of God? …Women are deeply wounded by living in this world, and wounded that men don’t fight for us. Instead, they fight to rule us, and we…sometimes we fight, but most of the time we believe them when they tell us we aren’t worth our weight (sometimes taken literally). Today I felt like a man was fighting for me, not because I can’t fight for myself, but because he recognized the wrongs in a world and a Church that have benefited him unfairly. Most of what I shared above is a repost from an earlier entry but I was reminded of that post by what I read this past week (and amplified with today being the International Day for the Elimination of Violence Against Women. It is one of the most gutwrenching things I have seen. Be warned of the graphic photos below. They are only a handful from the full photo article. Are you fighting for women or are you fighting to rule over women? Najaf Sultana, 16, poses for a photograph at her home in Lahore, Pakistan on Wednesday, July 9, 2008. At the age of five Najaf was burned by her father while she was sleeping, apparently because he didn’t want to have another girl in the family. As a result of the burning Najaf became blind and after being abandoned by both her parents she now lives with relatives. She has undergone plastic surgery around 15 times to try to recover from her scars. Next what’s your feel good movie? As the father of two beautiful daughters these images make me cry and angry at the same time. it’s pure evil. I don’t understand how someone could do this to another human being and live with themselves. It shakes me to the core to look at these precious women, created by God and marred by selfishness of others. this hurts my heart. 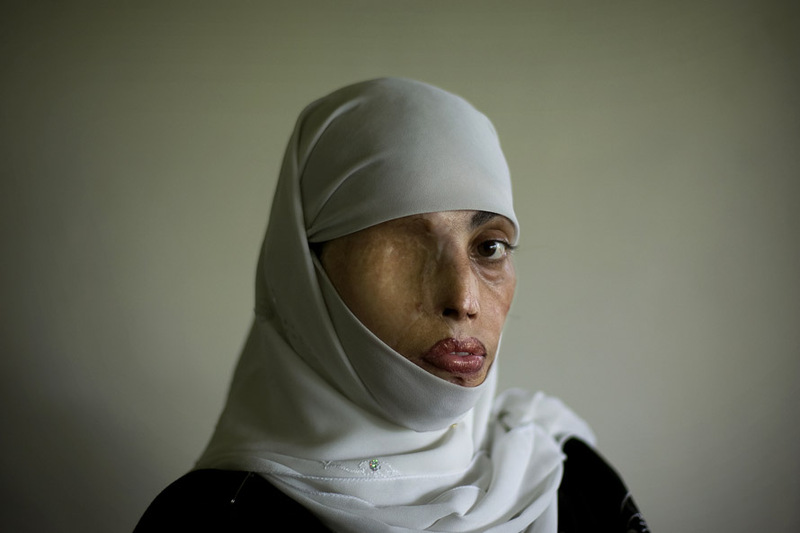 these wonderful women… scarred emotionally AND physically. i grew up believing the same things you did, eugene. i knew my place… raised by a proper Chinese mother… but now re-learning who God has created me to be. sometimes, i have a pity party about what i have/need to overcome… but this puts EVERYTHING into perspective. I know too many people who believe that spreading Christianity will solve the issue of gender inequality, but it is so much more complex an issue than that. 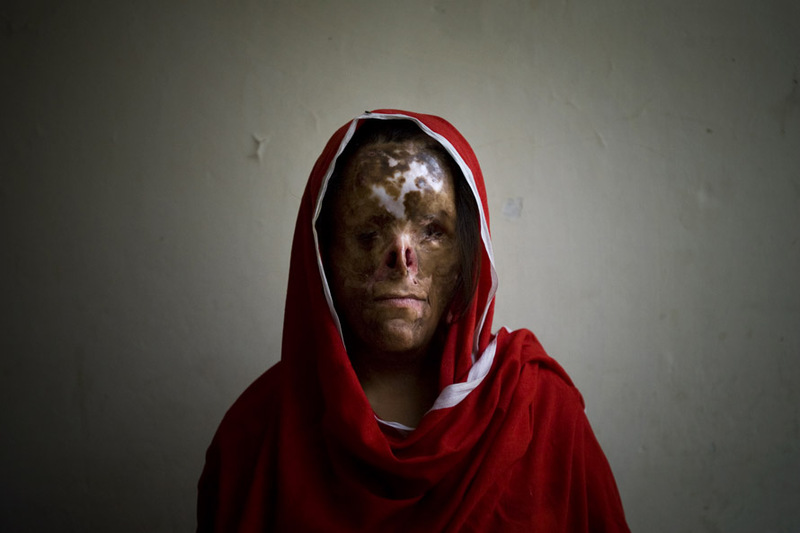 There are Christian converts in Pakistan who are still throwing acid in their sisters faces. Please remind every Pastor that you come in contact with that 1:4 American women are victims of domestic violence and that it is critical to have that conversation as part of pre-marital counseling. Good post Eugene, thank you. What would you say to those who agree that women are created equal but have different roles therefore cannot have authority in the church, i.e., ordination, elders? I do believe that culture has deprived of the role of the women as Christians. Paul said to men “Husbands, love your wives, just as Christ loved the church and gave himself up for her 26to make her holy, cleansing her by the washing with water through the word” (Eph 5:25-26) and I believe that if we loved our women as Christ loved the church, it surely does not equate to Confucianism nor passive/submissive (in the modern context) women, and that much more respect should be placed in our women… Thanks for your sharing. I would be interested in the question Rose posed, but out of respect for the unheard voices above I must just sit and take it in. Those will stay with me as they should. They will stay with me, perhaps forever. As an American white woman, I have so much power. I can write that truthfully, even as I have written elsewhere about how I am stripped of my equality before God by most of the Western church. Beyond that, our souls are forever bruised, our hearts broken — we long to be told from an early age that we were created (equal to men) in the image of God. My husband said that to me and I grabbed him! I know how rare it is for a man to say. Thank you for the reminder of the ways I do have a voice. I am clearing my throat and beginning to speak. When I was born my father called my grandmother and said “It’s a girl!” She replied “I’m so sorry.” This hurt my father deeply and he has always been adamant that he would not tolerate me or my sisters allowing anyone to treat us like we were anything less that an equal child of God. I am blessed to have him as my father. And I know, despite her initial reaction, that my grandmother is proud of me and loves me. But we don’t have to have acid thrown on our faces for people to be able to somehow disfigure the beauty and worth of being a woman. It happens in the west and particularly in the Christian community all of the time. We do it by programming women, like my grandmother, to feel disappointment at a grand-daughter’s birth. We disregard women’s intellectual and spiritual gifts. We tell women to be submissive because the Bible says so while men are allowed to ignore their part of the bargain. If you read the Bible in it’s entirety, not in selected bit’s and pieces that suit our egos, you will note that this is not what God wants. When a woman is wronged in scripture there are often grave consequences. The Bible is full of strong, assured women whom God used to fulfill his will. After being “born again” for years I finally sat down and made a commitment to learn scripture. And when I did I realised that God is always fighting for me. i love this last sentence, nancy. while it is our responsibility to fight for justice, and God actually keeps us accountable to doing so, it is a great comfort to know that God is truly fighting for us as well. God fights for justice and God’s heart breaks and rages for justice. Thank you for this Eugene, I didn’t know it was The International Day for the Elimination of Violence Against Women. The fight for equality has, apparently, in many places just begun. To those who would use roles to confine women to a life with less than boundless liberty: we can do better than the roles our ancestors created for their societies. Much, much better. And by the spirit of the living God I pray we do. Make sure you read the book, “Half the Sky.” Its written by 2 Pulitzer prize winners that have traveled the world gathering stories about women’s struggle in developing countries. This book is enormously important. And the more of it I read, the more I realize that it is not *just* the women who are oppressed in these terrible ways; the man who are coached to believe the things they do about women *and about themselves* are deceived and oppressed, too. Lord, have mercy. How ’bout we make every day the day that we do something concrete to eliminate violence against women? How ‘Bout we stop and register a complaint at the stores that carry violence in the form of titillation in the magazines? How ’bout we send a message to congress regarding the inanity of freedom of speech that demeans and objectifies women…inciting the violence? How ’bout we men in the church confront and challenge the violence perpetrated against women in the form of entitlement in male hierarchy? And, why, when we say women should not teach in church, do we relegate them to the most important teaching place?…the small children who are the most malleable brains in the body of Christ? Thank you, Eugene. It has seemed to me that the reconciliation of men and women, both made in the image of God, “in Christ” is key to the Church conforming to Christ. If, “in Christ,” there is neither male nor female as Paul asserts, then what possible justification is there for men in Church leadership not to build up and encourage women to be servants with the men called to service? Unless…they’re not really “in Christ”?? What image of God do we present to a world that is different than a metaphor of these heart-breaking photos of damaged women? The ongoing, daily torture, dismissing, subjugating and demeaning of women is mind-numbing. It is a pandemic that is millenia-long. It’s hard not to burn out in this work. The damage men do to their own souls, their families, their communities and all people when they harm and destroy women is immeasurable and the full cost will not be realized until The Day. From the beginning men were designed to be the protector of women, as they FIRST submit to God for His leadership in their lives. Weak men who allow women to be abused physically without doing anything to protect them from physical harm. But, those women who weakly return to men who abuse them physically, instead of calling the police to report them, and prosecute them to the fullest extent of the law let these abusive men get away with it. I am not sure which are worse, men who violate God’s trust in them by physically abusing women or not protecting them, or women who repeated allow themselves to be abused with prosecuting them. If a man truly submits to God, as Ephesians 5:25-31 says, he will never abuse his responsibility to protect the woman and children in his charge, and then can the woman submit unto her husband as onto the Lord as Ephesians 5:22-24 clearly requires her to do so. You use Paul’s words as authority, and yet you neglect his other words. Paul’s words in I Timothy 2:11-15 describe the need for women to submit to the Godly men in their lives, as they will protect her from being deceived (as Eve was the one deceived in the garden, not Adam), and not desire to teach or have spiritual authority over men. I Timothy 3 and Titus 1 also make clear God’s standard for biblical leadership, what kind of men are qualified to be leaders, and then the women can properly trust them. For women to quote one aspect of Paul’s teaching and then call him a misogynist in other area’s of his teaching is flawed reasoning, either the Bible and the Epistles contained therein are God’s word and can be thoroughly depended on, or they are merely men’s words that have no power at all. Picking and choosing which of Paul’s words (him being an Apostle, and so one who teaches with the authority of God) to agree with while discarding others is NOT exegesis, it is esigesis. To many weak men and weak women do it, to mislead others with their own opinions calling it “doctrine”. In the last days Paul warns us what will happen in 2 Timothy 4:3-4. We do best to heed FULLY the FULL counsel of God instead of using parts of the bible to beat up half the human race. Women who play the victim as a way to “feel superior” or actively incite the actions of abusive men by remaining in an adulterous or immoral relationship are responsible in their own way for the mess they ask for. There are women and men who are victims of evil men and women, those that stand by and not hold people truly responsible for their own behavior are just as evil, for they do NOTHING to stop it. i think that we really need to examine this issue both men and women in faith community. this is from The Washington against violence women network(http://www.wavawnet.org/Community/faith). “We know that a large majority of women relate to a particular faith tradition. Anecdotal evidence and research confirm the importance of this fact in addressing their experiences of sexual and domestic violence. In a study of African American victims of domestic violence, Bell and Mattis (2000) state that religion must receive particular attention in any dialogue about the role and impact of domestic violence in the lives of women. They confirm that most victims are likely to use religious coping strategies and are more likely to seek help from a minister than from any other helping professional. It must be acknowledged that faith leaders may or may not be helpful, but it is essential that they are engaged as we seek to find more comprehensive and collaborative interventions to improve the lives of women and children. Various studies confirm that victims/survivors with a deep sense of faith who experience abuse at the hand of their intimate partners often face a further dilemma of possibly relinquishing their faith community if they walk out of the abusive situation. Deep theological struggles relating to gender roles within the family were and continue to be central for victims and survivors. Domestic violence help-seekers often yearn for a more comprehensive response to their personal crises. They want advocates to acknowledge their faith issues and they want their pastoral caregivers to respond to their situations with informed compassion…. i know that while leaders teach about health relationship and gender equality among faith community, we also need to create right aid and resource for who are in need of help and protection. i think we all can be an advocate for this matter so we can challenge bigger community. Thanks Eugene, hard post to read and to look at for sure. I am working on a calendar for Lent, a calendar on Justice and the call of God on our lives. I would love to link to this post in the media section. that last post was from me, Phil. I was logged in to another wordpress account. oops and still thanks. Most of the comments focused on the atrocity of the pictures of women terrorized, and rightfully so. However, there is something so beautiful about the photographs as well. Beyond the torture and scars on there face, there is something deeper shining through. You can see it if you look hard enough. I see their beauty that once was and still is. Something that no cowardly man could take away. These pictures and these women have been given power. Power to influence us all and make us more aware. And power against the attackers. These pictures say, “Look me in the face. Look at what you’ve done.” It is almost like that Godly shame that comes from turning the other cheek. The oppressors are forced to look at the results of their own evil deeds. I’m with you 100%!! I regularly speak on Sunday about the need for men to fight for justice for women. As a matter of fact, my church is becoming known as a safe church for abused women. Unfortunately, there are very few safe churches anywhere for women. I am currently testifying in a high-profile murder case where a police officer has been charged with the murder of his third wife and he is the only suspect in his fourth wife’s disappearance. She had not been found. Thus situation taught me the great need for christian men to stand up and to do the right thing for abused women. I have now testified in other cases where women have been abused by their husbands. I’m also unafraid to tell an abused woman that it is ok to leave her abusive husband. Most of these men never change. I’m currently working with an expert in the area of domestic violence. We are creating safe plans for abused women. It is rewarding and simply the right thing to do. I would love to work with other pastors and churches in this, but most are not too interested for one reason or another. I have never,ever thought about that…. I cannot move little while after I read it…. …”We do best to heed FULLY the FULL counsel of God instead of using parts of the bible to beat up half the human race. Women who play the victim as a way to “feel superior” or actively incite the actions of abusive men by remaining in an adulterous or immoral relationship are responsible in their own way for the mess they ask for”…It makes me so upset and angry. *sigh*…It’s so easy to figure all of this stuff out from your armchair. Yet…it’s so much more complicated to flesh out. The relationship between an oppressed/abused person and their perpetrator is so incredibly complicated…and to imply that women who believe, perhaps even falsely, that they cannot escape this cycle…or even return intentionally to the hands of their abuser…are asking to be abused or being irresponsible…is losing site of the injustice and evil exacted on women and little girls. Too many times women in abusive circumstances in the West…and especially women who live in countries where this behavior is ‘the cultural norm’…literally do NOT have or perceive that they do not have any other options but to stay or submit. It’s psychologically and emotionally complex. If we or at least some of ‘us’ somehow misinterpreted God’s heart in regards to slavery as an institution or practice not intended at all or for all time…is it not possible that we have misinterpreted or misunderstood cultural identities regarding men and women applying something for all time…that maybe God never intended to be so? Eugene, you always make me proud! You should read Kristof’s book that he co-wrote with his wife called “Half the Sky”. On behalf of women everywhere, I say THANK YOU. On behalf of Christian women who have been made to feel that our gifts are lesser, I appreciate your attitude and help.